AN OUNCE OF HUMILITY GOES A LONG WAY. By now, if you’ve been in this series, you should be well aware that sometimes you make mistakes... and sometimes, some of them are habitual. The pattern we find ourselves stuck in is usually... though we don’t like it.... called an addiction. 1. They are habits that we recognize as unwanted, but are hard to change. 2. They do not change until we humbly come to grips with the truth that they are a controlling problem and that we are totally done with continuing in them. 3. They not only hurt us, but they hurt others too. ... that last one is a doozy. We like to believe that our problems are just that... OURS and they don’t affect others. Problem is... it’s not true. Our decisions- both good and bad- impact those around us.... Today we’re going to examine how and what we should do about those downstream from our poor choices. He intentionally makes a move towards Jesus. He responds immediately to Jesus’ words. Neither his response, nor the response of Jesus is popular with the society around them. Every year we host a seminar at Journey to designed to help youth workers understand how to best encourage and understand teens. It's called the CORE and it's put on by Youth Specialties. It's an outstanding day of training and this year, on Saturday, February 24th from 8:45am to 1:15pm. It's all about helping hurting kids. Click here for their website. I think this would be a TERRIFIC seminar and investment for you as a parent, not only in helping your own teen, but in helping and understanding their friends as well. Learn how to RECOGNIZE and RESPOND to hurting kids. Most often, kids will talk to the people they trust—not necessarily the person they're "supposed" to talk to. While the first step in helping hurting kids involves building a trusting relationship, there is much more that is needed to meet their needs. In three essential sessions, the CORE will unpack the issues that will equip your team to effectively minister to hurting kids, and work to prevent further hurt from taking place. This session will address some of the sources of adolescent pain, look at how Jesus reacted to people in pain (either from the actions of others, or from their own actions), and how you can partner with parents, the community, and other ministries to create a safe place for students. During this session you'll learn more about the five big issues you'll likely encounter when working with kids who are hurting, and how to address them in a way that brings healing, including: family breakdown, addictions, self-injury, suicide and depression, and crises such as death, natural disasters, accidents, and more. It's not enough just to know what to look for in hurting kids. You need to be ready to respond to their pain. In this session you'll learn what you can do to help them heal, how to effectively refer students to a professional when needed, and how to protect yourself in these situations. Sounds like a sure thing. I wouldn't miss it if were you. It's like getting CPR trained in case of an emergency. It never hurts to be well trained when a teen is in real trouble- be it yours or someone elses. You can shoot me an e-mail at brian@journeycom.org if you'd like to go and we'll get a group going. Our rate will be a little less than if you register online directly, so be sure and register through us. If I had a little more money, I’d be happy. If I had a body like so and so, I’d be content. I could win the lottery. -Ok.. so that’s not a total lie, but it’s more lie than truth. Anyway... one of the lies we like to tell ourselves is that we can solve our problems on our own. That we don’t need anyone else to help us get out of the rut we find ourselves in. Oops... I won’t do it again is what we tell ourselves. However... not only is this a lie that hurts us, it hurts those around us too. When we do not open up our lives to others, it only keeps them from opening up to us. As a result, we all feel the need to keep faking it, acting like we have it all put together when we don’t- for fear that others might “find out”. It’s an ugly lie. 6. We’re entirely ready to have God remove all these defects of character. Prov. 28:13 He who conceals his sins does not prosper, but whoever confesses and renounces them finds mercy. WE CANNOT CONQUER BAD HABITS ALONE. WE TRULY DO NEED COMMUNITY HELP. Confession is not just a private help, it a prerequisite to healthy community. Guilt cannot grow when we have nothing to hide. Sin does not grow in the light, but it flourishes in the dark. Our commitment level rises because our risk level went up a notch or two also. We spent some considerable time examining the prostitute who comes clean with her problems with Jesus and before the religious leaders of the day in Luke 7. We talked about how she was broken, repentant, and fully aware of her own sinful condition and contrasted it with those who thought they had it all together instead. 3 bad habit crushing actions of those who are truly done with sin. Anticipation for a better tomorrow. Feb. 17-18, 2007 we’re going up and down roller coasters and ski lifts. Here’s the scoop. We meet at church on Saturday morning at 7am. Go to Magic Mountain. Spend the night in a hotel near Big Bear. Get up on Sunday and go to Snow Summit. Come home 10pm Sunday night. Cost of the trip is $100 and will cover a t-shirt, breakfast and lunches, lodging, gas, and admission to Magic Mountain. 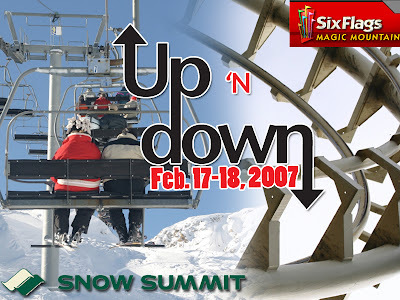 Two dinner stops and a optional lift ticket/equipment rentals at Snow Summit are additional fees and are detailed in the brochures available in the high school room. (as soon as I figure out where I can host the pdf, I'll link a brochure here too) If you'd like to drive as a parent, please contact us. You need a vehicle that is reliable and either 4 wheel drive or has chains to do so. Space is limited, so talk to your student soon. This is a great trip to have fun, bring a friend, get to know some new people, and break down some of those barriers that keep students from coming to youth group.